Hi, Everyone! Happy Monday! 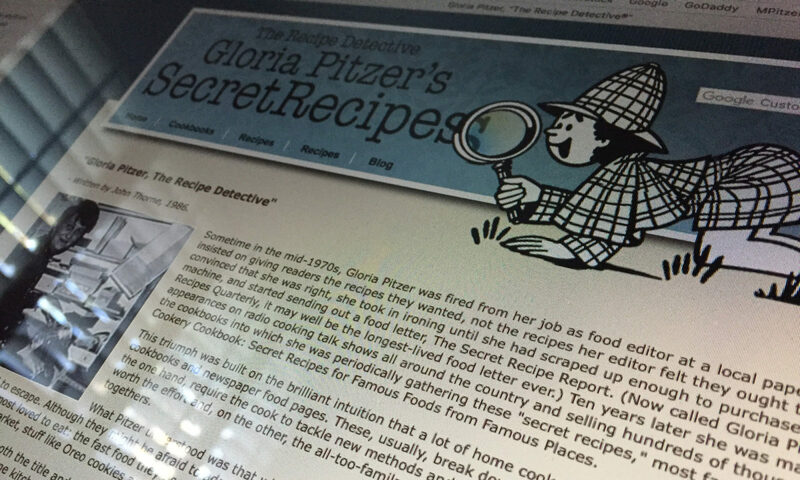 I’m Laura Emerich and this is my blog about memories of my mom, Gloria Pitzer, and her legacy as the ORIGINAL Secret Recipe Detective. 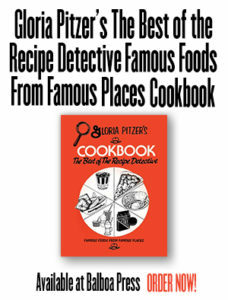 She liked to refer to herself as the “Rich Little” of the Food Industry because she could imitate their famous food products, at home in her own kitchen, like Rich Little could imitate the voices of famous people.. She never knew what they actually used in their own “secret” recipes, but she knew she could come up with a make-alike version based on what she could taste, smell and see. A few times, at the request of her readers and radio listeners, without actually trying the product, itself; Mom could come up with an imitation simply based only on their descriptions. To imitate is to clone, copy, impersonate, mimic, replicate, reproduce, counterfeit, duplicate, fake, forge, match, mock, parallel, resemble, simulate, echo, mirror, parrot, pattern or represent something or someone. Imitation – according to Merriam-Webster – is something produced as a copy; resembling something else that is usually genuine and of better quality [https://www.merriam-webster.com/dictionary/imitation]. It’s quite ironic that so many others over the years, since Mom originated the Secret Recipes (T.M.) business, have imitated her, the original imitator. But not all of them have given her the appropriate credit due to her. Kudos to those who have given her the proper credit, though! Most everyone has heard, “Imitation is the sincerest form of flattery”; one of Charles Caleb Colton‘s most famous quotes. Dictionary.com says, “to imitate someone is to pay the person a genuine compliment — often an unintended compliment.” You will, likewise, find at Wikipedia.org that imitation is also a form of social learning that leads to the development of traditions. I really liked that last reference…”that leads to the development of traditions.” Who doesn’t have some old, family tradition that they follow, just as their parents and grandparents and previous generations did? Who hasn’t made new family traditions for coming generations to copy and embrace? Just think about it, at some point, all of those old traditions were, once, new traditions that were so enjoyed they were, thus, passed on to future generations and continue to be so. Cultures are built on traditions. One of my all-time favorite musicals is “Fiddler on the Roof”, which is chucked full of traditions and the struggles of keeping them or amending them to the ever-changing times – including a song about it! However, she was well received, even complimented, by some companies and their owners, such as Sanders Chocolates, Wally Amos of Famous Amos Cookies, Harland Sanders (the original owner of KFC) and White Castle; just to name a few. They found her imitations of their products flattering. In fact, I recently came across an old letter among some of Mom’s things that I got after her passing. The letter was from Gail Turley, Director of Advertising and Public Relations with White Castle (Columbus, Ohio) to Mom – and I remembered writing about it when I helped Mom with the rewriting of her favorite “Better Cookery Cookbook”. Gail Turley was very flattered with Mom’s imitation and dually impressed with Mom’s clever use of baby food to enhance the flavor of the beef. She even bought 15 copies of Mom’s cookbook (which contained the White Castle Hamburger knockoff) to share with some of her colleagues. 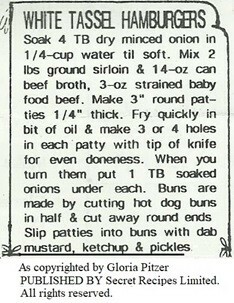 Mom’s make-alike version of White Castle hamburgers, also called “Sliders” because they’re so easy to eat (of which Mom called her version “White Tassel Burgers”), was one of the recipes she offered on her “free information” sheets. 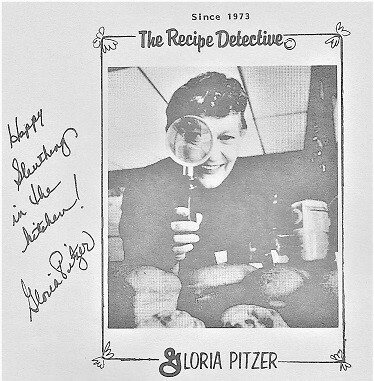 The White Castle picture with Mom’s original editorial on the company, along with other information and her make-alike recipe (all below), can be found on pages 12-13 of Mom’s last book, “Gloria Pitzer’s Cookbook – The Best of the Recipe Detective” [published by Balboa Press (January 2018, 1st Printing) – a re-write by me, Laura Emerich, of her famous, self-published book, “Gloria Pitzer’s Better Cookery Cookbook” (May 1983, 3rd Printing)], asking only for proper credit if you care to share it. 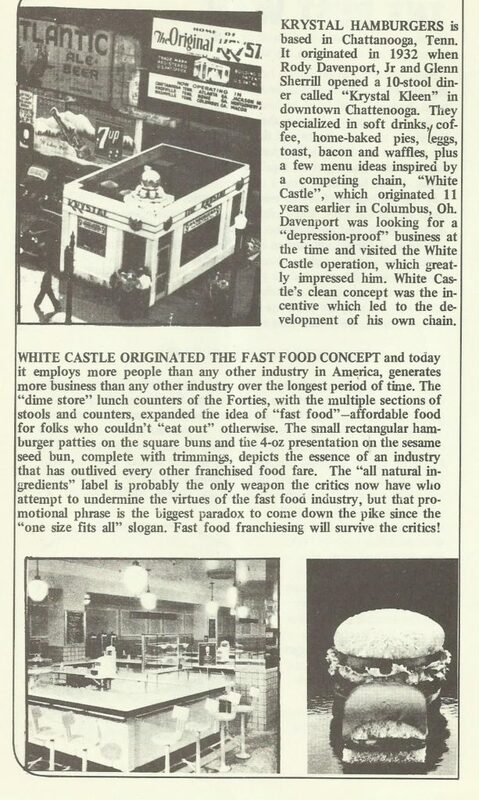 WHITE CASTLE – In 1916, Walter Anderson started his career in the restaurant field by opening a rented, re-modeled streetcar and giving the food industry its very first “fast food” place. In 1921, he ran into some difficulties when he tried to lease another place to expand his operation. So, he turned to a Realtor by the name of Billy Ingram, who secured the needed lease for Anderson, and soon became partners with him in the hamburger restaurant. Eventually, the operation became entirely Billy Ingram’s, and today White Castle is a respected name that represents “quality” in the food industry. Originating in Wichita, Kansas during “The Depression”, Ingram so-named his operation “White Castle” because it stood for purity, cleanliness, strength and dignity. He was a business man with high ethics. He was responsible for many changes in the business that initiated health inspections, to ensure that all restaurants complied with what Ingram personally felt was a responsibility to the customer. He invented utensils never used, such as the spatula and the grills that are still considered the most practical equipment. 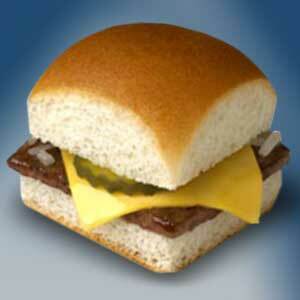 Supposedly, the original beef mixture used in the famous White Castle patties during the early 30’s was of such high quality that there was no way to equal it [50 years later.] Today we send beef to the market much younger, before it has aged. Young beef has less fat, which Americans want. The marbleizing fat in older beef is what gives it flavor. To compensate for this, it seemed to me, ground beef’s flavor could be enhanced by adding another pure beef product – strained baby food. It worked! Combine all ingredients thoroughly. Shape into 12 rectangular, thin patties. Fry briskly on a hot, lightly oiled flat grill, making 5-6 small holes in each patty with the end of a spatula handle. After turning patties once, place bottom half of bun over cooked side of patty and place the top half of the bun over the bottom half. Fry quickly to desired “done-ness” and remove. Add pickle slices and a few tablespoons of chopped, grilled onions to each serving. Makes 1 dozen burgers. This is a picture of Mom’s updated version from her “Free Recipes/Information” sheet (2000) – again, asking only for proper credit if you care to share it.